Many medications/tumor drug-treatments have been in trials for tumor management for neurofibromatosis type 2 (NF2) tumors. 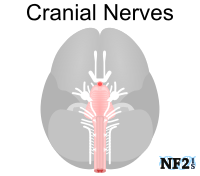 Changes in tumors 1: Tumor drug-Treatments for NF2 tumors are capable of attacking only one type of tumor either; 1) schwannoma, 2) meningioma, or 3) ependymoma. 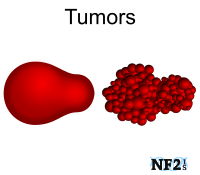 Changes in tumors 2: Medications to manage NF2 tumors is up to, but never over twenty-percent (20%) of tumor sizes. Delay: While tumor drug-treatments only reduce tumor size, this can help delay damage tumors can do until better treatments are available. Drug class: NF2 tumor drug-treatments are not chemotherapy, treatments are either molecularly targeted therapy or immunotherapy. Discuss with doctors: Choice of tumor drug-treatment should be made based on the immediate need for an idividuals most immediate need of tumor management. Currently, no drug treatment can attack all three tumor types. 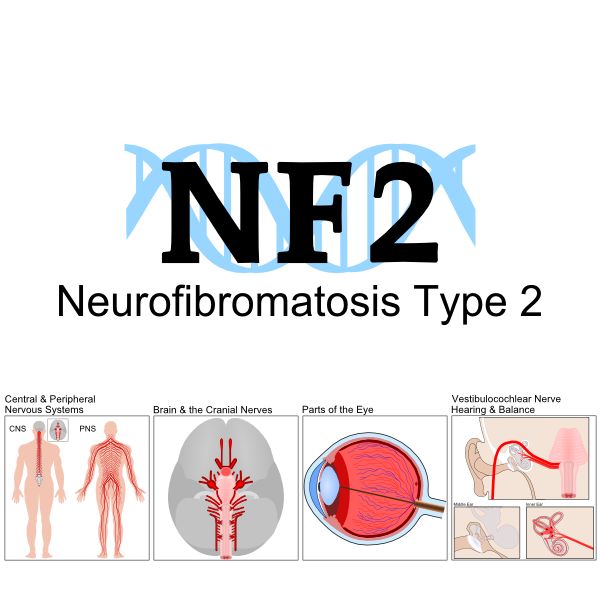 There is no cure to Neurofibromatosis type 2 (NF2). 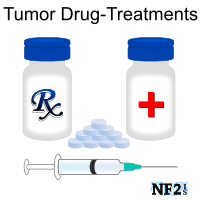 NF2 tumor drug-based treatments are experimental and in different phases of clinical trials. The list of tumor treatments here includes a breakdown or treatments noted as a trial option both new, to avoid the possible use of discontinued treatment, over options that are more likely to have better results. Links to existing drug-based treatments include known side effects are noted when after treatment has been in trial long enough for information, therefore not all treatments include a list of possible side effects. Awareness of side effects can help allow life adjustments to continue with treatment for a longer period. 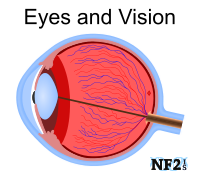 Why might a treatment work for some people with NF2, but not all people with NF2? 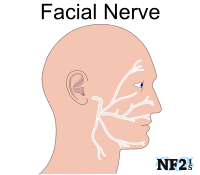 "The NF2 gene provides instructions for the production of a protein called MERLIN, also known as schwannomin. This protein is made in the nervous system, particularly in specialized cells called schwann cells that wrap around and insulate nerves. Currently, NF2 drug-based tumor treatments are only targeted tumor therapies, which have yet to do anything other than a percentage of tumor management for one tumor type at best. A few trials have proven to help some people with schwannoma, but trials started in 2017 are showing promise for meningioma. While there are advantages to considering participation in clinical trials for treatment, it is important to do everything you can to be aware of dangers for treatment before participating in a medical trial. There are different phases of clinical trials, each phase or step in the approval of a drug or treatment is carefully monitored to determine the effectiveness and possible side effects of each treatment. Avastin™ is the longest running NF2 drug-based clinical trial treatment, 2009. When it works, it has the possibility of affecting Vestibular Schwannoma (VS). The rates of tumors might change are different for each tumor in the same individual when it works. Study for review of NF2 Meningioma and Ependymoma have been in early stages, started in 2015. While Avastin™ side effects are minimal, after time, it can become hard to tolerate, and there is a chance of fast tumor regrowth during even three-month breaks for treatment vacations. Read more on side effect issues and other data collected in the Avastin - NF2 Community Informal Study. Trials should be available before the end of 2019, and while this seems like the preface; simple and inexpensive answer, it is important to read side effects of short-term and long-term use. WARNING: The first sign of hearing loss is tinnitus, and a known long accepted side effect of aspirin includes tinnitus and blood thinner. Sulforaphane (SFN) is an isothiocyanate found in cruciferous vegetables. SFN is available in both food and vitamin form. Research is necessary to determine if; 1) a specific brand is ideal, 2) if a pharmacy needs to make a better compound, 3) what other than SFN might be necessary for the results seen in early trials, 4) how to determine the correct dose (height, age, weight), and tests necessary for safety. Cancer/Tumor Condition: assumed as interchangeable terms, until a tumor is proven as not cancer class tumor. 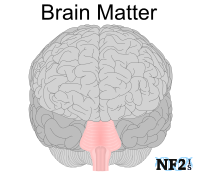 Diagnosis of NF2 means tumors seen in scans and otherwise are not cancer, unless a tumor is over a certain size. 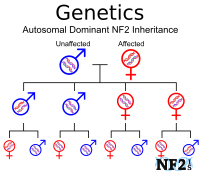 Example: tumor growth from neurofibromatosis type 2 (NF2), can become malignant (cancer), but NF2 is not a form of cancer. American Cancer Society, Inc. "Treatments and Side Effects"
Massachusetts General Hospital. "Manganese-based MRI contrast agent may be safer alternative to gadolinium-based agents: Imaging compound developed by Mass. General team produces comparable image enhancement to the standard of care with rapid clearance, less likelihood of toxicity." ScienceDaily. ScienceDaily, (15 November 2017). National Institute of Health and Research. (NHS) "UK Trials The Gateway." USA Clinical Trial Database. U.S. National Library of Medicine. "Clinical Trials."